The redesigned Hootlet, twice as fast. Launched in November 2009, Hootlet is now used by social media professionals every day to share articles, photos and stories across every major social network in nearly every country on the planet. Today, we’re happy to announce the release of a Hootlet tool that is twice as fast, with an updated design to make content discovery and sharing even easier. Hootlet is a Chrome extension created by HootSuite Labs that lets you quickly and easily share content to your social networks from anywhere on the web. Hootlet helps companies of all sizes tackle one of the biggest issues facing marketing and sales professionals: finding and sharing fresh content. The power of Hootlet comes from its ability to be everywhere you surf. Users can be anywhere on the web, click a button, and seamlessly share content to any or all of the social networks connected to their HootSuite account. Using Hootlet saves times by eliminating the need to copy and paste URLs and makes content discovery and sharing as easy as browsing the web. 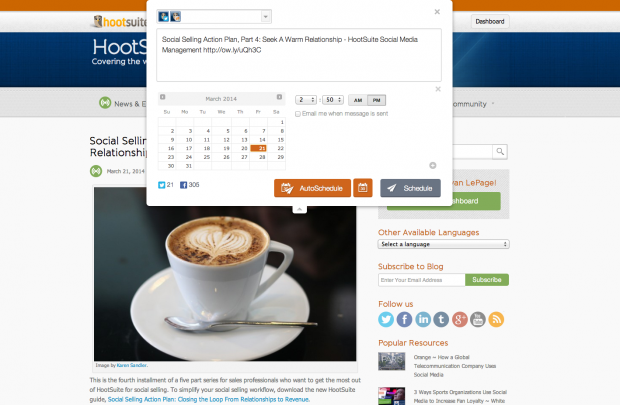 To ensure you can quickly fill a content calendar, the Hootlet features a schedule and AutoSchedule feature, which means you can schedule messages as you browse. HootSuite Labs are working on even more innovative products, so stay tuned! If you’re interested in keeping pace with innovation at HootSuite, tech news and social media tips, follow @HootSuite on Twitter.